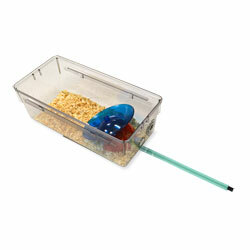 The Scurry-Trac System uses Bio-Serv® Fast-Trac Wheels for mice with the Lafayette Instrument Scurry Activity System to provide activity monitoring in standard shoebox mouse home cages. The Mouse Igloo® provides shelter and a nesting area while the Fast-Trac’s unique shape supports the rodent’s natural and instinctive running behavior. The Scurry-Trac Pad sensor sends revolution counts to the counter placed safely outside the chosen housing unit.